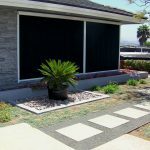 For the past 15 years, I’ve been creating both front and backyard design elements for San Diego homeowners. A majority of my work has been renovating existing backyards for greater functional space as well as an aesthetic appeal. In addition to pavers, colored concrete (non stamped) is also a more popular item. Adding a “sand” finish gives a great elegant, more contemporary and timeless look. I’ve also done patios using square concrete pavers, either standard grey or with colors, www.stepstoneince.com. 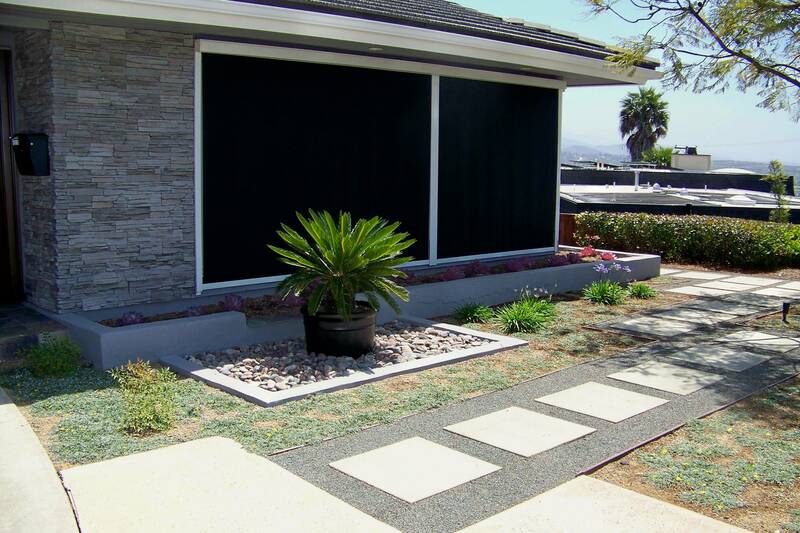 A few times, a certain client has asked for simply decomposed granite as a solid surface. Adding a stabilizer in the D.G. does allow to be another consideration and a good one if you are on a tight budget. Of course, brick, pea gravel, flagstone or tile set on concrete are other elements to consider. If the new patio is in full sun, you may want to consider a permanent structure such as a pergola or patio cover (two terms for the same element). Building this from redwood is the best option, and to avoid all maintenance aluminum is also a popular option. With wood, consider stain with a preservative for greater longevity. Paint asks for a lot more work later on with all the scraping and sanding. And there is sometime an aesthetic benefit to adding a colorful umbrella for shade, plus it may be best on a budget too. Decisions, decisions….a free standing gas grill or have a custom built bar-be-que island with seating, sink, refrigerator, side burners, warming drawers….the list goes on. When you have ample space the built in option for the grill makes sense. In smaller spaces a grill on wheels that can be moved to another location is a better choice. I’ve done oversized islands for a professional chef who planned to teach classes to his students. And I’ve created the fully enclosed outdoor kitchen with a vent hood and an outdoor oven along with the grill top. Outdoor kitchens are extremely popular for both everyday use or entertaining large gatherings. 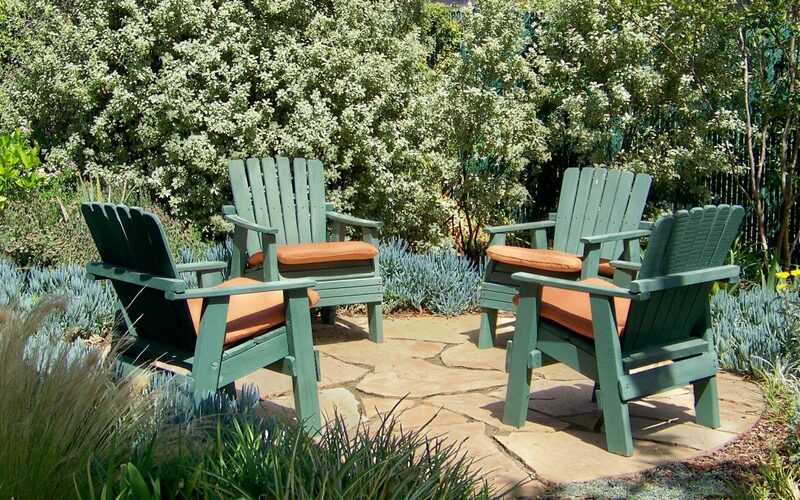 Once a patio is placed, it is necessary to consider the circulation of the entire yard. Where are the exits or gates? What is the current traffic pattern? If we are considering a bench or a spa, or even a built in Bar-be-cue, we’ll need a path or even step stones to reach the amenity. Lawn may be a consideration. Less is more with the rising cost of water. 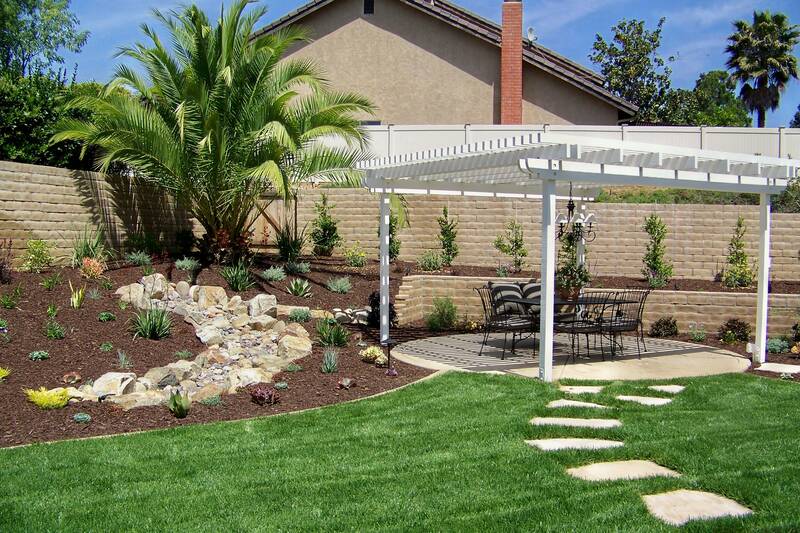 If there are children or pets, a small lawn may be included in the design. Otherwise forgo the lawn and think about adding more garden areas with low maintenance and low water plants. In this scenario, having other “outdoor rooms” is a great idea. It may be just a bench or a group of 4 chairs for conversation. And without the lawn, you’ll have a greater opportunity to add edible plantings such as dwarf citrus trees or dwarf stone fruit (peach, plum, nectarine, etc.) If you’re going to put water on it, have it give something back in the form of food production. And for the best growing for vegetables, a raised bed with imported organic soil with a drip irrigation system is the way to go for an at home harvest. I’ve done designs for outdoor pizza kitchens for those who aspire to master the art of homemade pizza in a wood burning oven. I’ve developed drawings for wood decks, grape trellises, retaining walls, bridges over streams or dry creek beds and even built in trampolines. Fire pits and fireplaces are also great amenities to consider adding the your backyard landscape. With the investment in new plantings, irrigation is a must. No one wants to be a slave to watering there yard day in and day out. Drip irrigation is fairly simple to install, ever for the DIY crowd. Let’s not forget a few other factors like drainage. Okay it doesn’t rain much (or ever lately) but when it does, water affecting the house is a major problem. Best to avoid this ugly scenario with a proper solid drain line routing water away from the house. What haven’t I mentioned?…..Landscape lighting is the icing on the cake. So as one can see, there are SO many elements to consider in the backyard. 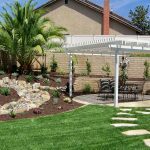 How it all works together, what materials to use (within your budget), how plants grow over time, how to have it constructed in logical phases are all key factors for your backyard design in San Diego. Letz Design Landscape can answer all your questions while providing the necessary guidance to allow you to enjoy the process and the end result for many years. Contact me today for a consultation! Living outdoors is the ultimate experience, we are all creatures of nature and need to have our own sanctuaries in our own backyards.